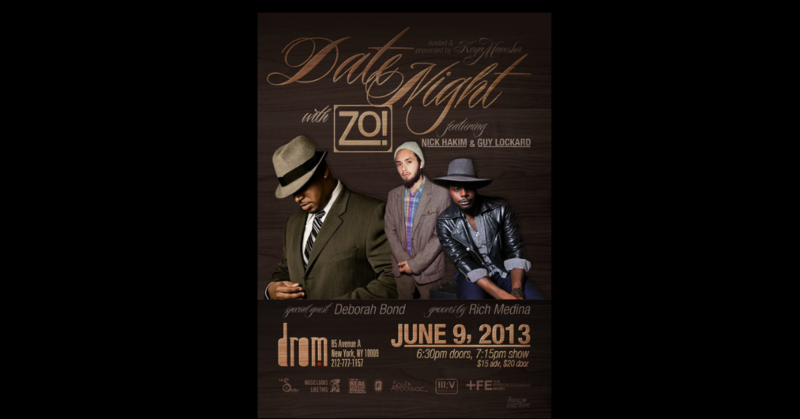 Home All For YouContests	TICKET GIVEAWAY: Keya Maeesha Presents Date Night with ZO! NYC Soulsters, what are you up to on Sunday, June 9th, 2013? Well, I have a show for you to add to your calendar. My girl Keya Maeesha’s Date Night series in New York City continues to shine a light on artists who are ready to bring the sensual and provocative vibes of ‘Date Night’ to life through their catalogue. This month’s installment is headlined by none other than The Foreign Exchange’s producer and keyboardist extraordinaire – Zo! Y’all know that Zo! is one of my favs and his recent release ManMade is a bonafide solid album from beginning to end, with tight production throughout. Can you imagine hearing that live and direct along with his other goodies from …just visiting, …just visiting too, and Abyss to name a few? To add on to that, he is coming along with some friends in tow to set the mood right. Nick Hakim, Guy Lockard, and the lovely Deborah Bond will be in the house to assist with the aural stimulation, while DJ Rich Medina will be on hand to deliver the tunes for the soiree at hand. I know you’re already excited and can’t wait to get your tickets in hand. Right? Well, this will all be taking place at DROM – you can find out more information and purchase your tickets right here on Ticketfly —-> through the DROM site. – The contest starts now, as of this post! The deadline for entries will be on Wednesday, June 5th at midnight. – The winner will be notified by email and text message on Thursday, June 6th.